This unit of work was created in partnership with The Garret and accompanies their interview with Leigh Hobbs. Please click here to access the Interview, Bibliography, Show notes and Transcript, and Author profile. Although Leigh Hobbs’ work is enjoyed by a very diverse audience, it is primarily directed towards young children. This teaching resource, however, is focused on senior students, keen to examine the craft and the art of writing for children as practised by the former Children’s Laureate, and to understand his motivations, influences, attitudes and approaches. Students studying the art of writing and illustrating books for children may also like to look at the Garret interviews with Andy and Jill Griffiths (also a Reading Australia teaching resource), Graeme Base and Alison Lester. The work of Kaz Cooke as outlined in her Garret interview may also be of interest. The following activities and tasks have been designed to be studied and used in full or in part, depending on the teaching context. The activities have been formulated for use with a whole class or small groups, and a suggested grouping is individually noted in each activity. All activities can be adapted to suit smaller groups or individual students. Each activity is linked directly to the Leigh Hobbs’ interview; however, as the interview ranges very widely across broad aspects of Hobbs’ work and creative life, it is not possible to focus on set segments of the interview for specific tasks. The interview has to be looked at as a whole. Hobbs cites Look and Learn magazine as a text that he loved growing up. Like any young boy, he was gripped by tales of pirates and history, and Look and Learn was a unique publication that brought together unusual facts and stories about history, art, legend, literature, philosophy, nature, science and geography, all complemented by original illustrations and comics. Categorise the articles in Look and Learn. What are they about? Explain the level of detail in the articles. Describe the target audience of this magazine. What evidence is there that leads you to your conclusion? Consider the illustrations in the magazine. How do they enhance or complement the material? In two to three sentences, describe the appeal of an educational magazine such as Look and Learn. voice and point of view as conveyed in the articles. Hobbs names British cartoonist, Ronald Searle, as an artist who grabbed his attention and pointed him in a certain direction. Searle was perhaps best known for his creation of St Trinian’s School for tearaway girls, as well as the young schoolboy character, Nigel Molesworth. Searle also illustrated the brutal conditions he witnessed as a Japanese POW in World War Two, the memories of which deeply impacted the tone of his future illustrations. Instruct your students to embark on a quest to uncover images from the Molesworth series. There is an interesting Facebook page dedicated to animating the Molesworth series and various blogs containing many excerpts from the pages of the books. A similar search will also bring up some of Searle’s illustrations of the girls from St Trinian’s School. Have them read about the two series including Searle’s motivations and inspirations. After looking at the work of Searle, give students a copy of one of Hobbs’ picture books: Old Tom, Mr Chicken or Horrible Harriet would work especially well, but all of Hobbs’ books lend themselves to closer analysis of characters. Choose one of the characters that Hobbs has created and one of the characters illustrated by Searle. Craft a character analysis of each, paying specific attention to the indirect characterisation (speech, thoughts, actions, effects, looks) conveyed through the art work. 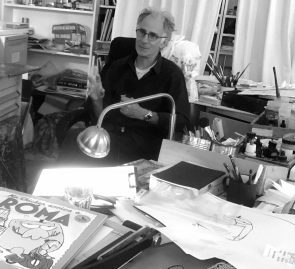 Hobbs’ work, from his early engagement as a cartoonist for The Age, his sculpting and his work with his ‘menagerie of characters’, dabbles in the realms of satire, irony and subversive humour. Hobbs explains that he has worked hard to develop an ‘eye for pictures saying one thing and the words saying something else and working against each other, and the humour coming from that’. Split your class into small groups and ask each to prepare a short presentation on the literary techniques of irony and satire. Presentations should include three examples of these techniques from popular culture. Assign each group a political/editorial cartoon. The Age publishes the latest work from their cartoonists on their website and some of these may be suitable, depending on the news of the week or your students’ interests. Analyse the political cartoon using the helpful study guides prepared for ‘Behind the Lines’ by the National Museum of Australia and the Museum of Australian Democracy (be mindful of dates of publication). Challenge students to create their own political cartoons. They should use the entries from ‘Behind the Lines’, as analysed above, as inspiration, as well as current themes, personalities, issues and news in the media at the moment. Students should create one cartoon (no bigger than A4 in size). Further experimentation can be done using Hobbs’ style of either constructing his books by developing cartoons that focus on crafting the image first and then the text, or the text first and then the image. Hobbs maintains that, ‘what you don’t want is…for the image to exactly mirror the text’. You could ask students to put together a gallery of their cartoons, where each piece is accompanied by a rationale highlighting the context in which the cartoon was born and is received. Hobbs remarks that Mr Chicken, despite being ridiculous, is a student of history. Fuelled by Hobbs’ own love of history, Mr Chicken visits Rome and Paris and explores the sights of each city. Provide students with the Mr Chicken books, Mr Chicken arriva a Roma, Mr Chicken Goes to Paris and Mr Chicken Lands on London, to peruse and identify characteristics of Mr Chicken as a tourist. How might Mr Chicken be a student of history in his travels? What important historical events or periods might your character visit? How will your character learn about the time? How can you eliminate the need for long captions/dialogue? Hobbs emphasises that children’s writers and illustrators should not ‘write down for kids’ and that children don’t necessarily want to hear the ‘bossy adult voice’ when reading stories. Challenge your students to craft a story for children that doesn’t tell them what to do and find a voice free from an air of authority that adults have. Leigh Hobbs and interviewer, Nic Brasch, discuss the nature of Hobbs’ stories as being driven by character and not conflict in his interview. This concept forms the basis of the rich assessment task.